You probably already know that one of the easiest ways to lower your energy costs and save money is to install and use a programmable thermostat. Yet, many homeowners have not made the switch, in part because of the hassle and… well… because they don’t want to learn how to use a new gadget that does not provide entertainment. 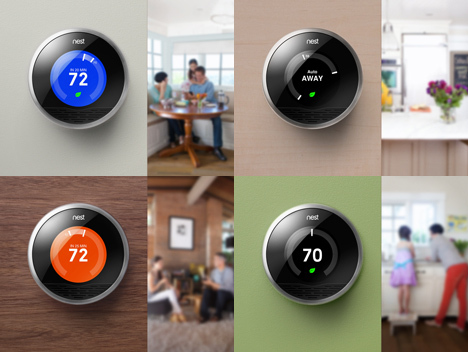 A team of computer experts in Palo Alto, California – led by a former Apple executive – hope to change this situation with the introduction of Nest Labs, a digital “learning thermostat” that includes cool features like a motion-tracking sensor that tells it when people are in the room and adjusts temperatures accordingly. Its time to reconsider the lowly residential thermostat! Nest Labs hope that their new high-tech thermostat will change the tide with respect to digital thermostats. Other makes and models of programmable thermostats have not captured consumer attention, in large part because they are difficult to use. People do not see a return on investment of the time associated with installation and use and thus, stick with what they know and have. The Nest Labs programmable thermostat will pay for itself within a year, and requires little thought or effort on the part of the homeowner! If you are interested in a Nest Labs thermostat to help you save energy and money, you can purchase one through the company’s website starting in November 2011 (or pre-order today), or go through Best Buy’s website. You can install it yourself, or hire a professional.